Bring the family and experience hands-on rural farm life including sheep, goats, chickens, and cows. In addition, we will also have a Blacksmith, Woodsmith, and Wheelwright, and our historic Farm House will be open. FREE and FUN for the whole family! EAS Master Beekeeper Larry Truchon will talk to SBA members about bee biology in the Steppingstone Farm Museum Studio Building. Check your email for information and the link to sign up. Offered through Harford Community College. Fee $60. Join the SBA! Learn about member benefits here. Current members: there are 52 (at least) ways for you to commit just a little or just a little more of your time and talents to the club! You'll have no trouble finding where you fit in. The goal of the SBA is to educate association members and the public about honeybees, beekeeping and related arts, to provide a resource for established beekeepers, to aid new beekeepers in bee management techniques, to inform the public about the value of honeybees, and to promote beekeeping in general! SBA apparel is now available. Check out the Bee Board for details. 'tis the season! Harry Dutcher's Swarm Seducer presentation from the April meeting is available for download here and on the past speaker presentations page. Young beekeeper grants were awarded to Malinah, Emma, Michael, Braeden, Blake, and Zoe (not pictured). Congratulations! Anyone interested in mentoring one of these new beekeepers, please contact Jason Rubin. Jason Rubin's Bee-minder notes for each SBA meeting will now be posted on the website. The Bee-minder page is linked from the meetings page, as well. 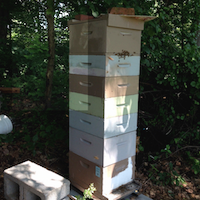 One of our young beekeepers is doing research for his senior project, and would like SBA members to complete a survey about bottom board configurations and mites. Please download and complete the survey, if you haven't already. Recordings of the talks given by young beekeepers at the October meeting are now available. Check out this page to listen to updates from these talented folks. Hearty congratulations to one of our "Young Beekeepers," Lina Goetz! She won "Senior Champion" at this year's Harford County Farm Fair 4-H division for her jar of honey. She also took a 1st place ribbon for her bees wax candles. EXCELLENT JOB!! 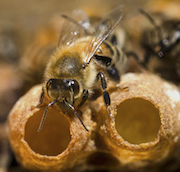 A new version of the Honeybee Health Coalition Tools for Varroa Management is available and is linked from the science/bees page. Explore resources from SBA members and meeting speakers, including articles and videos about bees and beekeeping, in the two sections under 'keeping bees,' above. Susquehanna Beekeepers participate in The Bee Informed Partnership, The Sentinel Apiary Project, and the Hive Scale Program.